10 Edible Artisan Gourmet Gift Boxes for Gorgeous Corporate Gifts. With this purchase you will receive 10 gift boxes, each with items as pictured, each individually nestled in our gorgeously green signature eco gift boxes with 100% recycled fibre kraft tissue, hearts, dried flowers, twigs, herbs and love! This package is priced to receive a 20% discount from regular price on your corporate gift purchase. 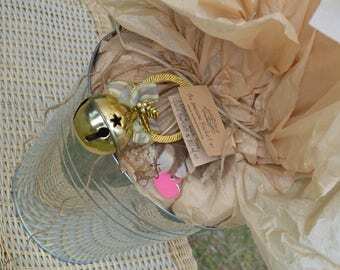 This package evokes memories of an old country store in an english garden filled with love. Just message us your personal letters or notes with your purchase and we will add it to your packages. Includes everything for a new kitchen pantry. 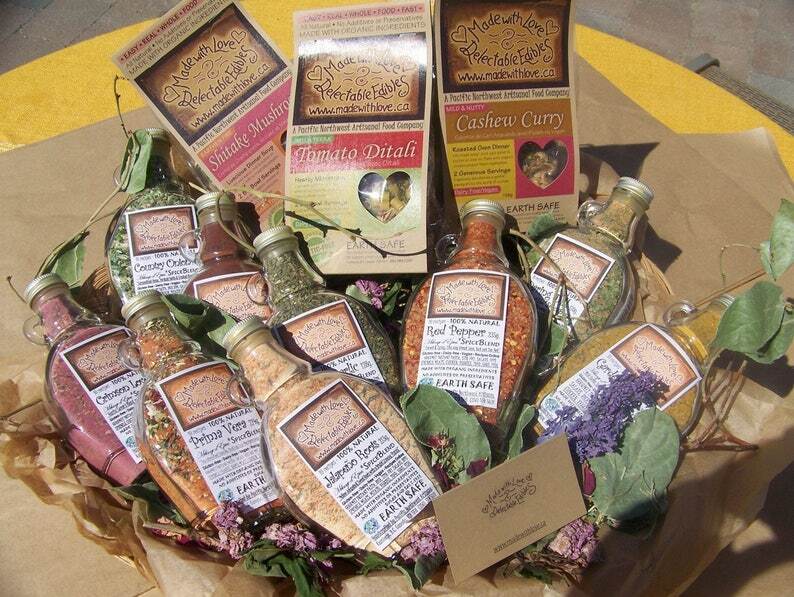 All nine flavours of Made with Love Eco Artisan Spice Blends in our 9 oz regular size glass bottles with hand-dipped natural happy beeswax seals and a sampler of our popular Magic Meals. A conscious, ethical green corporate gift. A spectacular Christmas, Anniversary or Housewarming gift for your clients, board or team. A thoughtful green real estate gift for your best clients. *** Your purchase comes nestled in our signature eco gift package with gorgeously green dried flowers, twigs, hearts, herbs and spices & 100% recycled fibre kraft tissue & note card. Rich Jalapeño with garlic, onions, sweet peppers & lime in a dried carrot base. This sugar/salt free blend uses natural vegetable sources to obtain a balanced flavour with natural sweetness. Creamy dips & pasta are gorgeous. Spice up your mashed potatoes, guacamole, veggies, meats, fish or salsa. On popcorn with nutritional yeast flakes, this blend is thoroughly addictive. INGREDIENTS: dried: carrot, jalapeños, sweet peppers, onion, garlic, lemon juice, herbs & spices. A mild curry blend with a mix of garden vegetables. One of our most popular Spice Blends, Garden Curry appeals to all taste buds, even many who believe they don't like curries. In creamcheese, pasta or yogurt dip it creates a mild, rich and flavourful sunshine cream! Add to your rice or quinoa, soups, stirfry and lovely with chicken, eggs or fish. 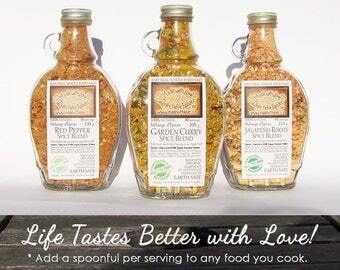 INGREDIENTS: herbs & spices, dried carrots, onions, peppers, leeks, cabbage, unbleached raw turbinado sugar & natural sea salt. With tumeric - a powerful source of antioxidants. Our Country Onion is a traditional mix of fresh garden herbs, caramelized onions and chives. An extremely versatile blend, great on poultry, meats or eggs, fabulous for potatoes and herbed rice. Love it for savoury herb biscuits, dip mix, ranch style dressing and in creamcheese on a bagel. INGREDIENTS: herbs & spices, dried onion, unbleached raw turbinado sugar & natural sea salt. Pesto Garlic is our sun dried rendition of its namesake. Not fresh pesto but an easy instant version that is extremely versatile. No pinenuts or cheese here so safe for vegans or nut-free, just a beautiful blend of the herb flavours traditionally recognised as pesto. Great for pasta, meats, salads or dip mix. Excellent on roast chicken, grilled veggies, in soups or on fish. Daring Dill is truly our most sophisticated blend full of great dill flavour followed by a hint of fresh tomato and a hot mustard finish. Lovely on veggies, chicken or fish. Excellent for vinaigrette dressings and creamy sauces. A must have for scrambled eggs, on boiled new potatoes, asparagus or green beans. Our Daring Dill Dip Mix is truly Delightful! INGREDIENTS: herbs &spices, dried tomato & onion, unbleached raw turbinado sugar, natural sea salt. Aztec Chocolate is a complex blend of Raw Cacao, Coffee and Vanilla Beans with pungent sweet and spicy peppers in a deep dark rich cocoa base. A traditional savoury mix for Mexican & Latin American cuisine, led by the ancient Aztecs and Mayans. Try it on meat dishes, beans or lime juice salad dressings, this amazing sweet and spicy combo is great for everyday cooking. We love it for a simple linguine or pork chops with sweet peppers and mashed potatoes. Your secret ingredient in brownies, cookies or chocolate cake or for real mexican hot chocolate. A fabulous decadent desert dip and as a finish for chocolate mousse or cake with berries and cream. INGREDIENTS: cocoa, turbinado sugar, raw cacao, vanilla & coffee beans, dried spices, chillies, natural sea salt. Red Pepper is sweet with a mild spice similar to a pepper jelly or a thai-style hot and sweet flavour. A blend of turbinado sugar with a mix of sweet and hot chilies. 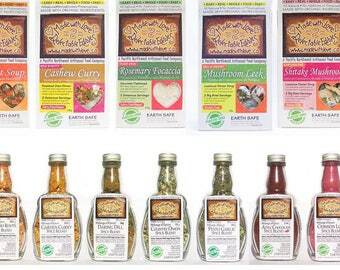 Amazing on veggies of any kind and a wonder to sprinkle on chicken, pork or fish. Gorgeous creamcheese spread, addictive dips and a wonderful addition to baking in biscuits, breads or pancakes. Great in mashed potatoes or melt in your popcorn butter for a spicy caramel corn. INGREDIENTS: unbleached raw turbinado sugar, spices & natural sea salt. Prima Vera is a wonderful blend of sun dried tomato, sweet pepper and Italian herbs and spices. Try this blend for creamy, red or clear pasta sauces, salad dressings, soups, in creamcheese on a bagel it is heavenly, dips and as a spanish-style rice side dish. Gorgeous on chicken or fish or for a magic ratatouille just saute with a little butter, wine and Mediterranean vegetables. INGREDIENTS: dried vegetables (tomatoes, peppers, onions) herbs, spices, & sea salt. A garlic lover's blend with a strong essence of rosemary in a dried beet base with hints of nori and fresh greens. Developed with our sugar free/salt free friends in mind this blend's natural sweet & saltiness comes from whole vegetable sources. Wonderful for dips, dressings or pretty pink pasta! 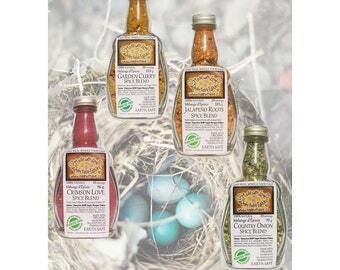 We love it for vinaigrette and on steak, fish, chicken or lamb. INGREDIENTS: dried: beet, garlic, spinach, carrot, herbs and spices, nori flakes. YOUR BOX WILL ALSO CONTAIN Three Magic Meals as pictured: All flavours can be prepared with organic meat/chicken or strictly vegetarian recipe options as desired. Thank-you for your conscious spending! Together we are changing our world. Our Motto: Happy Healthy People on a Happy Healthy Planet!